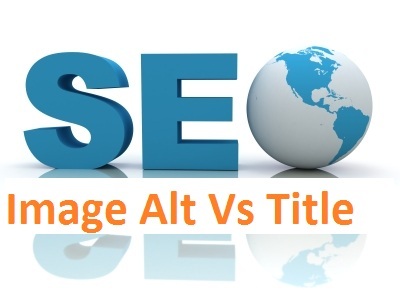 Image Alt Text Vs Image Title Tags- Which Is Important For SEO? With the latest SEO update to Blogger, we are provided with an option to add alt and title tags to our images with the help of a single click. The question arises about the importance of alt and title tags.While thinking of these two fields, which one should be given more importance? These are the questions that would surely come up in our minds. Alt tags or 'Alternative text' to an image is simply a text that we add to the image properties so that it can be used in certain situations. You may have noticed that an alternative text is shown up for a particular image when your Internet connection seems to have problems or when the images are turned of through the browser. Either way, it is always a great idea to add an alternative (alt) information about the images. Likewise, we could add image title tags so further explain the image to search engines. Apart from the reasons mentioned above, it is extremely important to have these tags (most importantly image alt tags) so that search engine would give more priority to your content as a whole. Alt vs Title Tags? Which Is More Important? Ok so we wont talk about an ideal situation. Obviously its best to add both of them to an image. The more we would explain our content (image) to search engines, the better it is. But the questions arises about the importance of each. Some of you have asked about the difference between the "alt" and "title" attributes. According to the W3C recommendations, the "alt" attribute specifies an alternate text for user agents that cannot display images, forms or applets. The "title" attribute is a bit different: it "offers advisory information about the element for which it is set." As the Googlebot does not see the images directly, we generally concentrate on the information provided in the "alt" attribute. Feel free to supplement the "alt" attribute with "title" and other attributes if they provide value to your users! That concludes that Google gives much more importance to the image alt tags while indexing an image from a link. My Advise: What Do I Do? Its simple guys. Nothing too techie. It takes a no more than 30 seconds to think of a keyword rich and targeted alt and title tags. You normally start writing a post after you choose the title, so by the time you have to add these tags, you are already into the way to decide keyword rich alt and title tags for the images that you use in the post. So i hope it helped and i look forward to write about choosing a keyword rich image tags that would drive traffic through search engines. BloggingeHow | Making Blogging Simpler: Image Alt Text Vs Image Title Tags- Which Is Important For SEO?